Volcom Steps Up its Footwear Game! After 22 years in the fashion biz, Volcom is finally expanding its modest flip-flop offerings into a full-fledged footwear collection! 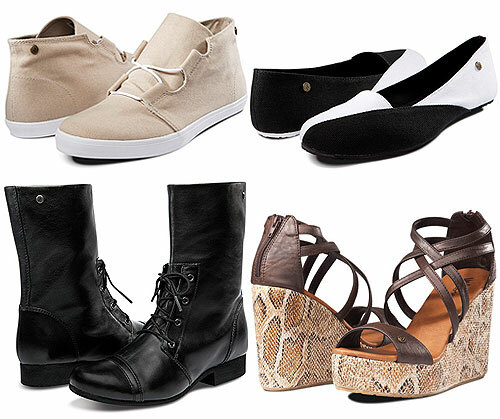 Earlier this month, Volcom launched its footwear e-commerce site, boasting a nine-piece collection for both men and women that includes boots, platform wedges, canvas flats and sneakers, and more, ranging in price from $50 to $150 a pair. The lifestyle apparel brand, which has specialized in outfitting surfers, skaters, snowboarders, and more for over two decades, aims to expand its demographic with its easy-to-wear, versatile, and durable selection of new shoe styles. What do you think – are you impressed by Volcom’s first attempt at close-toed footwear, or will you pass on their fall shoe collection? Let us know in the comments, and check out the rest of the styles on Volcom’s official footwear site. Pictured above: Art Show Canvas Sneakers, Game On Ballerina Flats, In the Mode Mid-Calf Boots, and Getting Around Wedge Sandals.